This lovely little silver Picanto. Is a excellent first car, with free tax, cheap insurance and costing almost nothing to run as it does 67.3 mpg average. This would be great as a first car, it has 5 door, air conditioning, great cup holders that fold away. We will even give this car with a full tank of fuel to set you off with. Bringing those running costs down even more for the first few weeks. This compact, stylish city car has plenty of personality and comes well equipped. Sleek exterior styling is matched by a refined interior that's spacious enough and flexible too thanks to 60:40-split folding seats. A raft of ingenious technology options makes driving the Picanto easier and safer than ever, while the model's economical performance ensures you'll be able to keep running costs down. 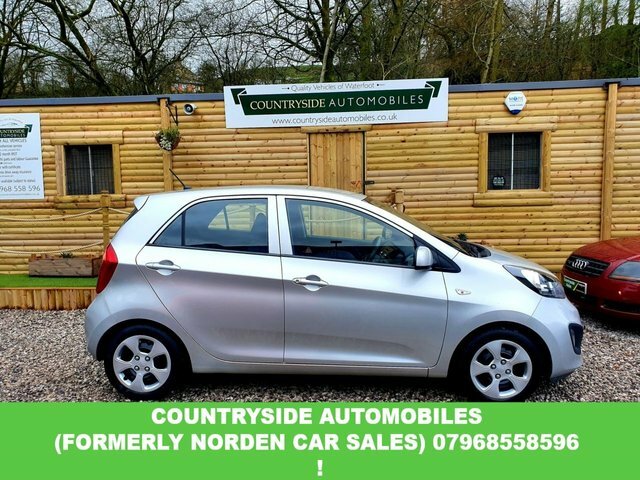 Here at Countryside Autos you'll be able to choose from a great selection of used Kia Picanto models for sale in Waterfoot, all of which have been thoroughly tested and checked before going on sale. Get in touch with a member of the team today to find out more and to arrange a test drive.